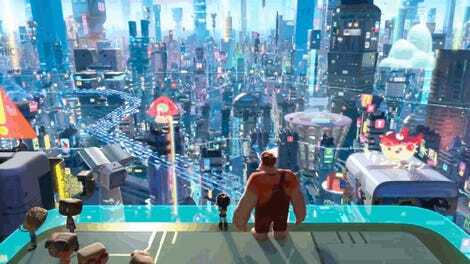 This scene from Ralph Breaks the Internet has started to, uh, break the internet. It all began at the D23 Expo last year. 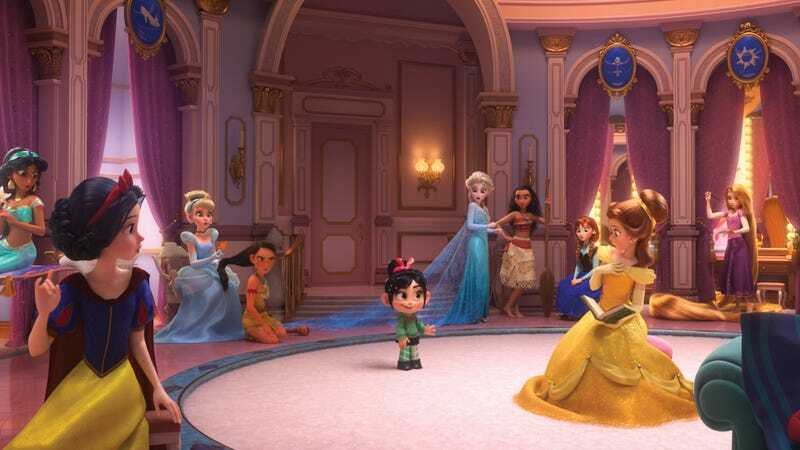 That was where Disney first played a scene from the Wreck-It Ralph sequel, Ralph Breaks the Internet, in which Vanellope von Schweetz meets 14 iconic Disney princesses at once. The clip crushed the audience of Disney super fans and has since been glimpsed here and there as moviegoers wait for the final film in November. However, at a recent press event, Disney pulled back the curtain to reveal how the scene came to be. The idea came into clearer focus when the film’s co-writer, Pamela Ribon, posed the question of whether Vanellope was actually a canon Disney princess. Of course, she was literally named a princess in the first movie, a movie released by the same animation studio as Beauty and the Beast, Snow White, Cinderella, and The Little Mermaid. She would qualify, right? And if so, why couldn’t she meet them? Just some princesses, having a laugh. Ribon got up off the floor, went into work, and pitched the idea to Moore. He told her “Let’s board it and see what happens.” So they did. When they watched it in storyboard form not only did Moore love it, everyone else on the team did too, and they put it into the production pipeline. Next, they had to show it to the rest of Disney Animation. Here’s a quick glimpse of the relaxed outfits. Getting approvals was just the first set of problems. Then there was the fact most of the Disney princesses had never been visualized in 3D. Also, most of the hand-drawn characters didn’t exactly look uniform. Some were realistic, but others weren’t, so a team lead by art director Ami Thompson began to translate the characters into a modern, 3D aesthetic, making them all look like they lived in the same circa-2018 Wreck-It Ralph world. Disney also brought in Mark Henn, a veteran animator who worked on several of the princesses’ original movies, to lend a hand with the visual details. The filmmakers also knew the scene called for the princesses to change into more comfortable clothes. So, the entirety of Disney Animation was tasked with pitching clever, Disney themed t-shirts for each princess. In the movie, they go by in the blink of an eye—but every princess has a shirt with a fun inside joke about them. For example, Pocahontas has a shirt that says “Blue Corn Moon,” Belle’s says “Beast Friends Forever,” Tiana’s says “NOLA,” Sleeping Beauty is “Nap Queen,” Ana’s says “Finish Each Others” on a sandwich, Elsa’s says “Just Let It Go,” Jasmine’s has the genie’s hand making a “3" with the word “Wishes” under it, and on and on. The original voices return for Ralph Breaks the Internet (taken at D23 Expo last year). Most importantly, all the living actresses who did the original voices of the characters were brought in to reprise their roles (Ribon voices Snow White). Those actresses, so well versed in their respective princesses, helped the scene evolve even more, sprinkling it with additional personality and quirks, until it became what audiences will see in the film.